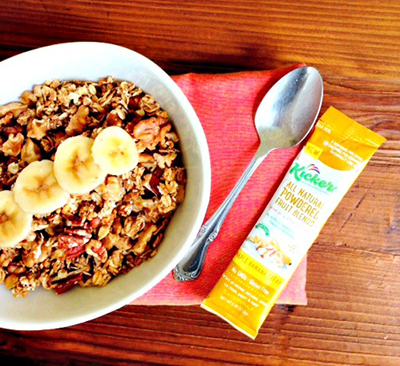 Make your own flavored granola with this delicious and healthy recipe for Maple Banana Granola from Annmarie of the blog The Fit Foodie Mama! 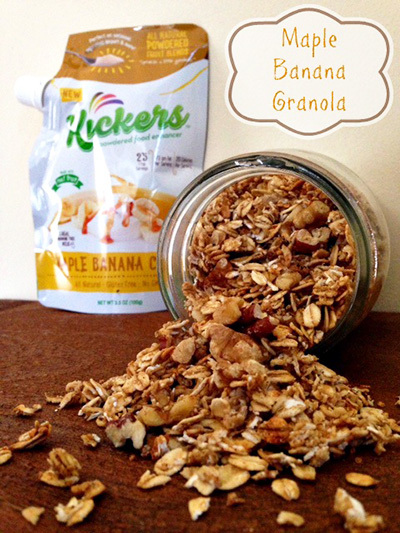 She reviewed Kickers products and shared some of her favorite recipes, starting with this one! By using Maple Banana Cream Kickers you can add a ton of flavor and powdered goodness to this recipe without adding a lot of sugar. Directions: Preheat oven to 350 degrees. In a large bowl, mash banana then mix in oats, nuts, cinnamon, and vanilla. Sprinkle in the Maple Banana Cream Kickers and mix. Pour coconut oil in and mix thoroughly. Line a large baking sheet with parchment paper and then evenly spread mixture over top. Bake in the oven for approximately 25 minutes making sure it doesn’t burn. Remove from the oven and let cool. Store in an air tight container.